This is the beginning of what appears to be a great year for poetry in our lives. 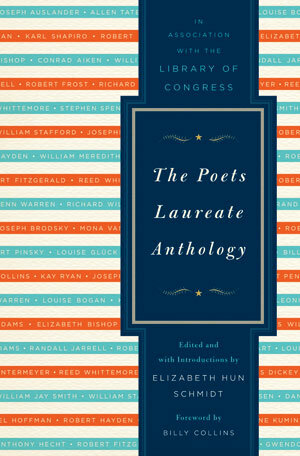 Someone finally had the sense to gather in one compendium, the poems of all the American poets who have been appointed over the last 75 years to the office of “Poet Laureate.” The sensible one here is Elizabeth Hun Schmidt, “Forwarded” and abetted by none other than justly-popular poet, Billy Collins (who held the Poet Laureate office from 2001 until 2003). The book is a treasure trove for those who love American poetry (legions, I know). The surprise is that the book, while presenting some of the best poetry by the normal suspects of 20th and 21st Century American poetry (Frost, Lowell, Bishop, Williams, Lowell, Kumin, Brodsky, Haas, Gluck, Pinsky, Merwin, etc. ), manages to introduce us to some great poetry from poets that were previously unfamiliar to us (we’re ashamed to admit: Kay Ryan, Rita Dove, Stephen Spender, Leonie Adams and Louise Bogan). Below is a sampling of our favorites from this fine collection. Please give a close read, and give poetry a chance to immeasurably illumine this life. The first reminds us of the Hardly Strictly Bluegrass Festival, the Live Oak Festival and other enchanting environs where folk music flourishes. I saw the old come out to dance. But heavy like a bough in spring. she’d only see her own vivid blood. and keep you in the cell under lock and key. and boy i can assure you you’d love the drill. give you my red lipstick and puff your nose. renlentlessly erupting from my hidden source. To the nature of money. I show you this nickel. He wears the number nineteen-thirty-six. To notice it, indeed, would be shortsighted of him. Somewhat resembling that of Jupiter Ammon. With respect to the understanding of what is symbolized. In other words, let us be methodical and slower to anger, and let us resist the urge to canonize or excoriate. Instead, let’s be thoroughly thoughtful and give wisdom at least a toehold’s chance before speaking or acting rashly. We have miles to go on this front before we sleep (yours truly, especially). We hope that poetry will nudge your world a little this year. This entry is filed under Poetry.